Ok! So I had a dream about these. I had to wake up and make them. I ate two for breakfast but, don’t tell my Weight Watchers leader because I am totally trying to lose more weight than Jessica Simpson. We are in a weight lose war only she doesn’t know it. And if you tell my leader, he might make me stay after the meeting and write “I won’t dip my food in chocolate no matter how good it is!” on the board 500 times. Or worse! He might make me do sit ups!! 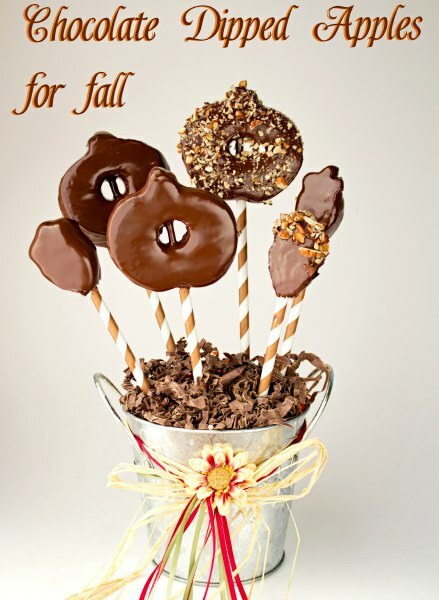 Maybe if I take him one and tell him there is a delicious apple under all the chocolate and nuts he will forgive me! Maybe. I can’t tell you how much I love these paper straws. When I found out that Bakers Stock had fall colors, I almost did a back flip! The chocolate brown goes well with anything chocolate. I can’t wait to use the red and the polka dot ones! The first thing you need to know is how to melt chocolate. I found a YouTube video from Taste of Home if you want to watch. The lady is a little boring but, she give a good explanation of melting and adding oil to make it smooth. Now that you know how to melt chocolate so it is smooth, all you have to do now is prepare the apples. Gather a few cookie cutters in your favorite shapes. I used a pumpkin and a mini acorn. Wash your apples good to remove the wax. I didn’t peal my apples but you can if you want to. Slice the apples. You need to slice them thick enough so they don’t break when you add the skewer. I used Gala and cut them about 3/4″ thick. Cut one to use as a test piece before you cut them all. Cut the pumpkins first and use the smaller pieces for your mini acorns. This will help you use all the apple with very little waste. Blot the apples with a paper towel to remove the moisture. You want to remove as much moisture as you can so the chocolate will stick. Core the apple. I used the circle end of a piping tip so I would have a nice clean circle. 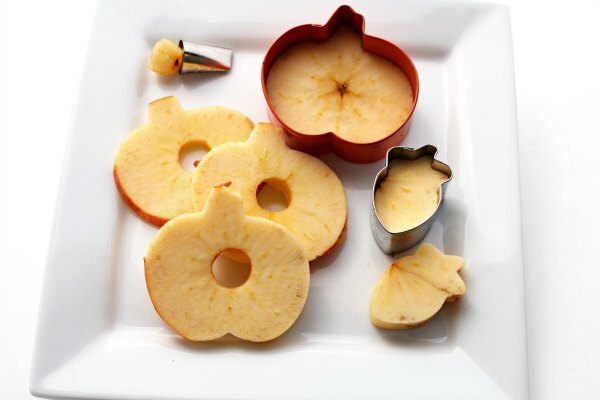 You could also use an apple corer. Add a skewers to each piece. 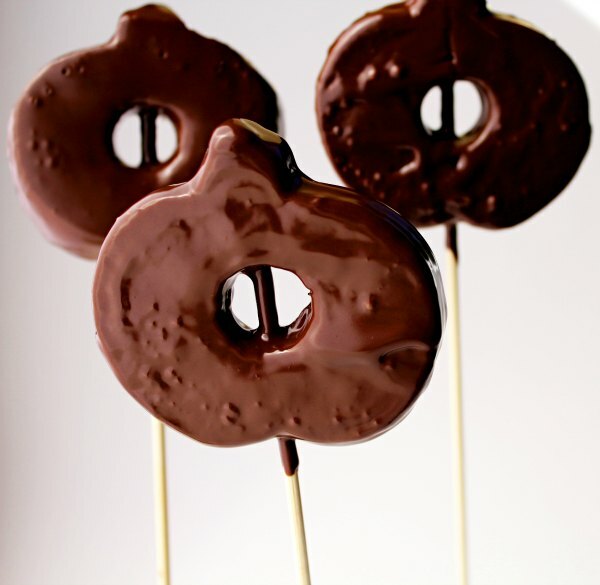 For the pumpkin shapes, start at the bottom and run the skewer through the hole to the top of the pumpkin. I found it easier to go slow giving the skewer a twist as I applied pressure. Melt the chocolate and dip each piece. 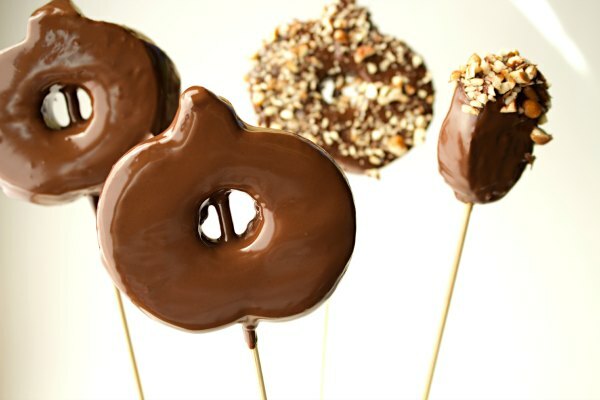 Once dipped, stick the skewers into the styrafoam cake dummy while the chocolate sets. I am a double dipper and proud of it! This is the first dip. A little lumpy for me. This is the second dip! So much better! If you are feeling a little nutty, while the chocolate is wet, sprinkle with nuts of your choice. You could also use fall colored sprinkles. I think orange would look great with the chocolate. Thanks for letting me hang out with you all today! I had so much fun and can’t wait to do it again! I have lots of amazing memories of my mother in my memory bank and a lot of those endearing remembrances have to do with time spent with her in our farmhouse kitchen. Mother’s health was not good most of her life, but she was blessed with good years while my sister and me were young which allowed her to spend quality time with us and do the things mothers do with their daughters during their younger years. My mother’s favorite word was WONDERFUL and she said it often in her last days. I often use that very word to describe one of my favorite desserts that my mother made…German Chocolate Cake. I was certain I had her recipe for this WONDERFUL, delectable cake, but hadn’t been able to find it. My sister and I recently looked through a box of recipes we had collected from mother’s kitchen and found a recipe for Royal Chocolate Cake and attached to it was a recipe titled Icing for German Chocolate Cake, so I figured this was what I needed to duplicate mother’s WONDERFUL German Chocolate Cake. Equipped with all the ingredients I needed, I took on the task of replicating mother’s prize dessert. When it was done and I did my taste test, I knew, without a doubt the icing was the one, but not the cake. It was too rich. What was an obvious, out-of-place item in the list of ingredients that needed to be substituted was the semi-sweet chocolate. I couldn’t give up on achieving my goal of preparing mother’s cake just like she did, so I decided to gather what I needed, again, but this time to make cupcakes and substitute German chocolate for the unsweetened chocolate. My first bite, of the first cupcake, confirmed my results….Mother’s WONDERFUL German Chocolate Cake (Cupcakes). Sift together flour, sugar, baking soda and salt. Add shortening and 1 cup milk. Mix until all flour is dampened then beat 2 minutes at medium speed. Add remaining milk, eggs, chocolate and vanilla. Beat 1 minute longer. Pour batter into two 9 ½ inch round pans. Bake in 350° oven for 30 to 30 minutes. 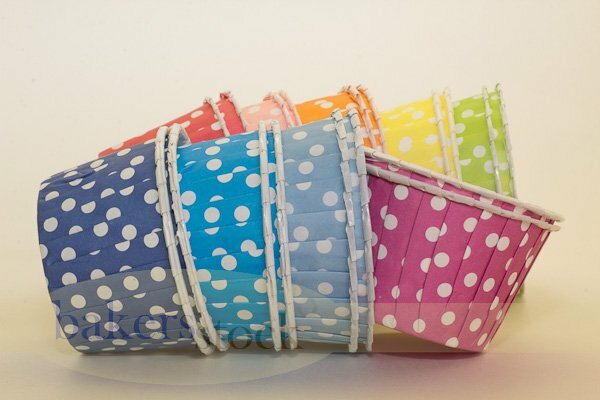 For cupcakes, line 24 cupcake tins with paper liners. 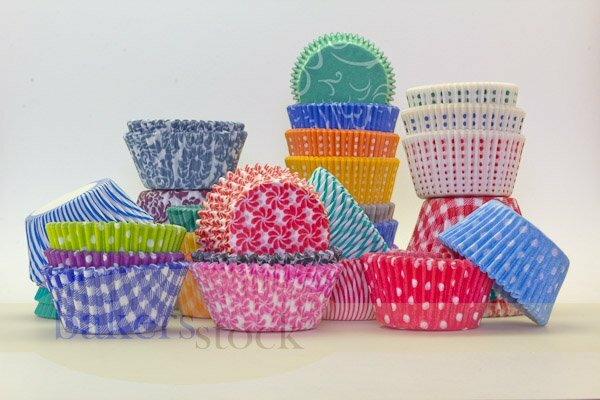 I chose these beautiful cupcake liners for this special recipe from mother. They reminded me of the days spent in our pastures on our farm picking wildflowers. Bake in 350° oven for 20 minutes. In a medium saucepan, whisk together milk, sugar, egg yolks. Add margarine and heat until melted. Bring mixture to a boil, stirring constantly. Continue at a boil, stirring constantly until mixture begins to thicken. Remove from heat. Whisk in vanilla. Stir in coconut and nuts. Mother used pecans. 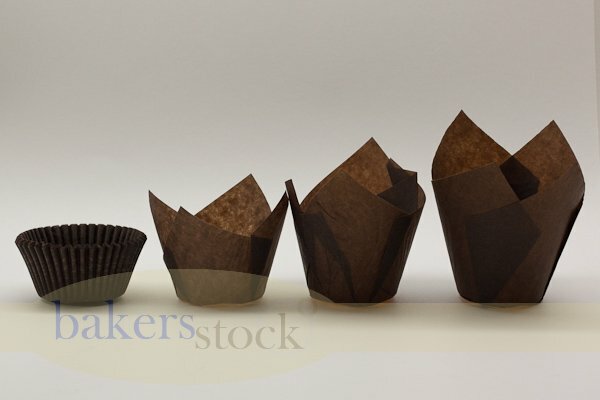 Top each cupcake with a heaping tablespoon of frosting while icing is still warm. Spread icing and top each cupcake with a pecan.